In order to place your content on Instagram in the best way and to find fitting influencers for your brand, it is helpful to know what the users are most interested in. 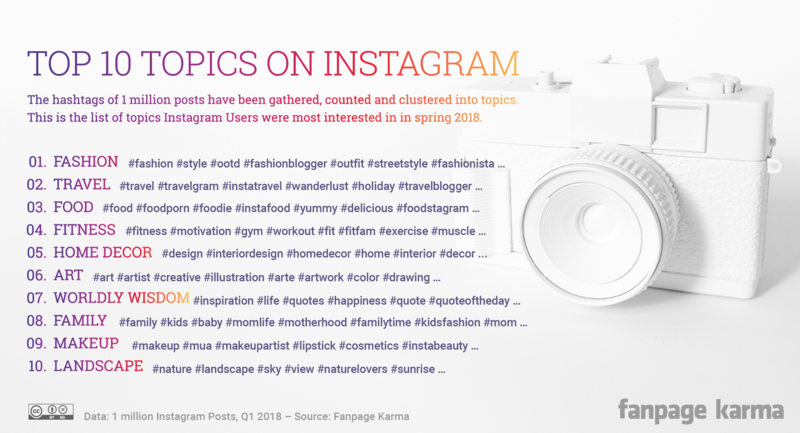 We found out the top 10 topics on Instagram of spring 2018. We analyzed the hashtags of 1 million posts and clustered them into topics. The order of the ranking is due to how often the hashtags were used. 1. It is no surprise that fashion is number one on the list. Clothing, shoes, purses, jewelry and co. are more popular on Instagram than anything else. The hashtag #fashion alone can be found below more than half a billion posts. No other network is better for spreading fashion trends than Instagram. 2. Travel came in second. We are talking about more than “just” beautiful beaches and colorful spice markets. 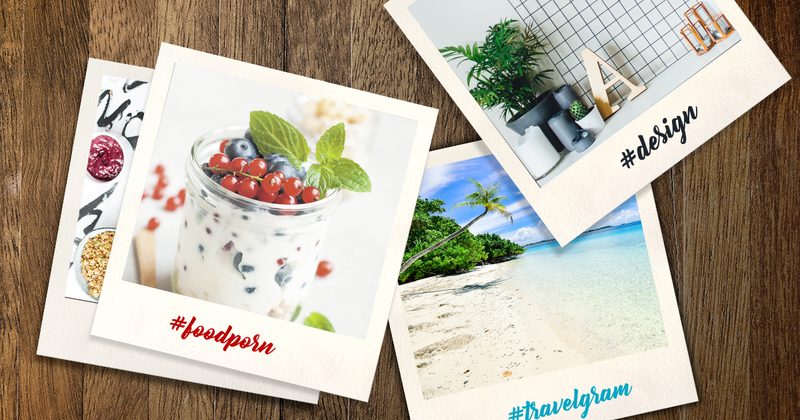 Through their posts the many travel bloggers give their followers a taste of a whole lifestyle. If your product fits into this topic, matching it with relevant hashtags will create enormous reach. 4. Fitness is fourth on the list. A lot of people desire to be good-looking, fit and vital. Hands the success of all the fitness Instagrammers. Their workout and dietary tips, as well as personal stories, motivate plenty of users. It might pay off to cooperate with one of them. 5. Home Decor. A lot of Instagram Users use hashtags of this subject in their stories, pictures and videos. Like Pinterest Instagram works well for the gathering of inspiration for designing home and garden. 6. Art. Over 350 million posts are carrying the hashtag #art. Whether or not they are worth being called that is a matter of taste. One thing is certain though, art is a hit on Instagram. 7. Worldly Wisdoms are a big trend on social networks. Hashtags of this topic can be found on posts of profiles of any branch. A nice quote put in front of a gorgeous scenery or colored background… that’s always a fit. 8. Family is very important on Instagram. Posts dealing with parenthood, pregnancy, babies, kids and all are gathered under the many different hashtags. The hashtag #momsofinstagram, for example, appears about 2 million times on Instagram. 9. Makeup is a real business on Instagram. Some like it natural, some won’t stop after just one layer. In any case the hashtags #mua, #skincare and co. take care that posts of this category are spread amongst cosmetic and beauty enthusiasts. 10. Landscape. Ever seen a picture of a sunset on Instagram? That’s right. Sunsets, beaches, forests, mountain ranges. Nice pictures of natural landscapes are always appreciated and get a lot of likes. Depending on the platform you are on the top topics can be very different. Twitter, for example, puts great emphasis on politics and daily news. Therefore, often times you get to see and read things that are uncomfortable. Not so on Instagram. There you will almost exclusively find content that has an uplifting effect on your mood. One might call it the Feel-Good-Network. Here is another example of differing preferences on different platforms. 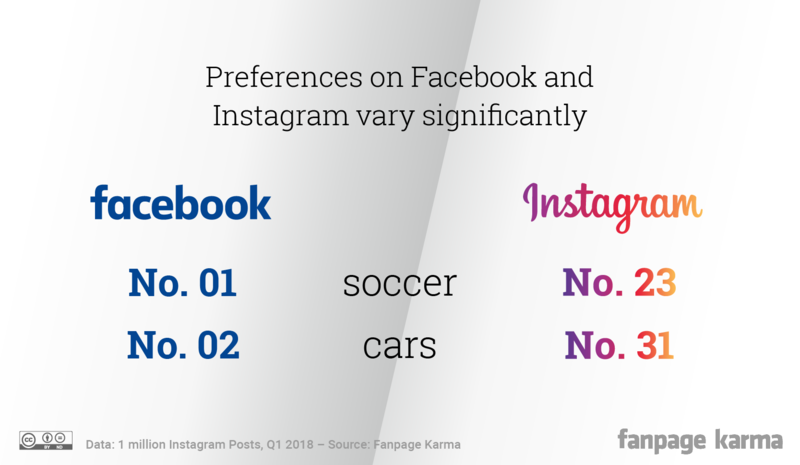 Whereas soccer and cars are the most liked topics on Facebook, they only make places 23rd and 31st on Instagram. To sum it up: On Instagram, no matter the topic, posts have got to be pretty. They have got to please the eye in some way. Whether it is a family picture or a plate of spaghetti, put it in the right light and people will like it. Of course you have to make sure they are able to find it first..
Our Hashtag-Composer will help you find the most fitting hashtags for your post in no time. It just needs one hashtag to start with from you that is topic-related and not totally unknown on Instagram. Now you get a selection of hashtags that are connected to it and relevant on the network. Choose up to 30, copy them to your clipboard and add them to your post.